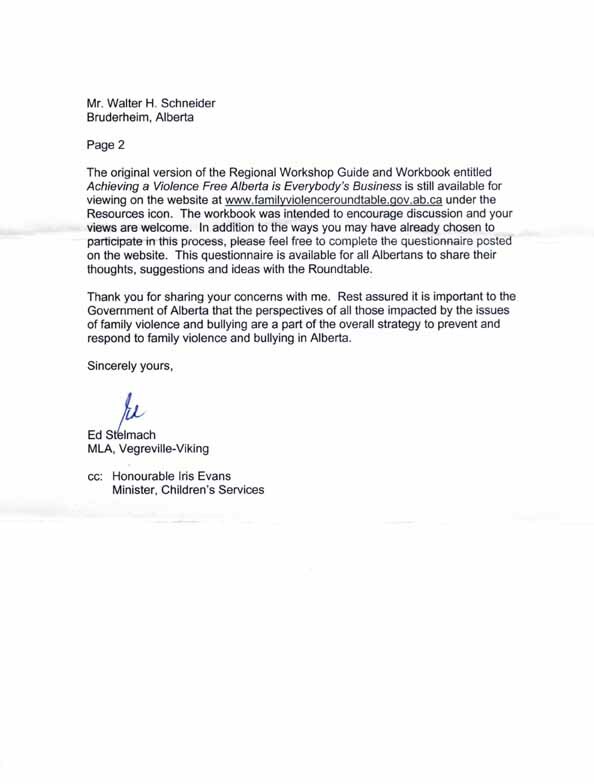 The original version of the Regional Workshop Guide and Workbook entitled [sic] Achieving a Violence Free Alberta is Everybody's Business is still available for viewing on the website at www.familyviolenceroundtable.gov.ab.ca under the Resources icon. The workbook was intended to encourage discussion and your views are welcome. In addition to the ways you may have already chosen to participate in this process, please feel free to complete the questionnaire posted at the website. The questionnaire is available for all Albertans to share their thoughts, suggestions and ideas with the Roundtable. Thank you for sharing your concerns with me. Rest assured it is important to the Government of Alberta that the perspectives of all of those impacted by the issues of family violence and bullying are a part of the overall strategy to prevent and respond to family violence and bullying in Alberta.